A rotational grazing system will have three main physical factors to consider: forage supply, fence system, and water supply. A good rotational grazing system begins with a forage system that allows the maximum number of grazing days per year with forages that are suited to the land, livestock, and manager's abilities and desires. Forages can be divided into two main categories: cool season and warm season species. These categories differ in their seasonal ability to produce grazeable yield. Cool season species perform best in spring and after the weather cools down in the fall. Warm season species perform better in late summer when it’s typically hot. Most grazing operations have a base of cool season forages, with species such as Tall Fescue, Orchardgrass, Kentucky Bluegrass, and also will contain legumes such as white and red clover. Forbs may also be a part of the composition as well. The two biggest challenges in assembling a balanced forage system are maintaining supplies of quality forage in midsummer and extending the grazing as long as possible into the fall and early winter. Many forages are available that are productive in midsummer, but they all seem to have disadvantages that rule out their use for some producers. Alfalfa, for example, requires deep, well-drained soils and a high level of management for best performance. Eastern gamagrass and other native warm-season perennial grasses are slow to establish, and seed is expensive compared to other forages. Stockpiled tall fescue is the best forage to use to extend the grazing season into the late fall and early winter. A balanced and well-planned grazing system will allow some acreage of tall fescue to be taken out of the summer forage rotation (due to the presence of summer forages) and rested and fertilized for use in the late fall. Typically in most grazing systems warm season grasses do not naturally grow in cool season stands. There’s no one fit that will provide forages the entire grazing season and into winter. Does all this mean that you have already is inadequate and you need to re-seed your pastures? No, absolutely not for most cases. Most pastures, with some changes in management, and changes in the infrastructure of the grazing system itself will provide enough improvements for the existing forages in the system to develop and thrive. Work with what you have first before you consider the high costs of prepping and re-seeding. Once you’ve done the tweaks in management and have set up the grazing system, then you can look at integrating summer annuals, warm season grasses etc, to help fill in summer slumps that occur in cool season forage based pasture. If you do get to the point of considering re-seeding, remember this: forages should be matched to soils that will maximize their yield and growth. For example, tall fescue and white clover are well adapted to thin soils or steeper sloping sites that will hold water for growth during spring but will dry out during summer. These fields would be poor sites for warm-season forages because they hold little moisture for summer growth, which would be the period of maximum growth for these species. In another example, highly productive forages such as alfalfa should be planted on the deepest, most productive soils. Rotational grazing usually relies on an electrified system to subdivide larger pastures. Development of high-voltage, low-impedance electric chargers allow fencing of large acreages without losing voltage because of fence line vegetation. These energizers send high-voltage, short-duration pulses down the fence. Although 2,000 volts is considered adequate to control most stock, most fence chargers and systems should start with around 7,000 volts on the fence. There is no standard system for comparison of energizers, and every manufacturer has a different scale. Joules are the most common measure of power in energizers. The joule rating is calculated using a combination of voltage, amperage, and pulse duration, and changing any of them affects the joule rating. Generally speaking, fencing system needs will grow, so obtain enough energizer capacity to cover future needs. Energizers come in mains, or plug-in units, as well as battery and solar units. It is best to use a plug-in energizer, if possible, because it delivers more charge (joules) per dollar spent. The wire in the fence is then energized, and the conduction of electrons back to the energizer depends on the soil. This system is generally effective in the in areas with soils that have high mineral content and adequate rainfall. A good ground is essential for the effectiveness of any electric fence system. The ground system of the energizer is like radio antennae. A large radio collecting waves from a long distance needs a large antennae, and a large energizer powering a lot of fence needs a large ground system with a minimum of three 6-foot galvanized ground rods. These rods may be placed in the ground at an angle if there is less than 6 feet of soil. Ground rods should be driven in a damp place, if possible, such as under the drip of the barn roof or in a low area. For most types of grazing operations, the most economical controlled grazing fencing system is often one that includes a combination of permanent, electric, smooth, high-tensile wire fence and temporary portable polywire (available on reels). An advantage of the reel is that it allows rapid setup and takedown of fence for temporary arrangements or strip grazing. Portable step-in fence posts are often used with the portable braided wire, using one strand of wire for grazing of large animals and two strands for younger or smaller animals. Once permanent perimeter fencing is installed, the internal fencing can be temporary and is a lot more flexible to many changes, such as ones made for management, livestock numbers, and weather. Water is the most important, but sometimes least considered, nutrient for livestock. It is needed for virtually every body function. Many factors influence water intake. As air temperature increases above 40°F, water intake generally increases per pound of dry matter consumed. Lactating animals require more water than dry animals. At a constant temperature, livestock consuming more feed need greater water intake. Similarly, if water intake becomes limited, feed intake will decrease, and performance will be limited. Lush pasture can be 70 percent or more water and can decrease the amount of water that must be supplied in the water system, at least on a short-term basis. Water intake restrictions can result from inadequate access of livestock to the water source, water temperature, and water quality. Quality is determined by total dissolved solids (TDS). High TDS levels may not pose serious health risks but may decrease total water intake. Water exposed to direct sunlight (tanks, ponds) can become quite warm in the hot days of summer, resulting in lower intakes as well. Regardless of why decreased water intake occurs, performance will suffer. Cooling water has been shown to reduce heat load and allow increased feed intake. Studies have shown the most acceptable water temperature to be in the 60° to 80°F range for livestock. Using insulated drinking receptacles or building shades over the water tank can reduce heating from the summer sun. Insulated or heated waterers will be needed for pasturing stockpiled forage during late fall and winter. The location of water in the grazing site will greatly influence grazing distribution. During hot weather, livestock will typically congregate nearer the water source, resulting in less use of pasture farther from the water source. Research has shown that the maximum distance most livestock will travel to water and not decrease grazing uniformity is 800 feet. As travel distance increases above this amount, pasture use decreases. Consider using the raw water source of springs. They are an excellent source of water but are as different as grazing systems. A stream of water the size of a pencil and a large collection tank will water a lot of livestock. Also consider ponds as a water source. Watering from tanks below ponds is strongly preferred to watering directly out of the pond. Although there is a monthly cost, public water supplies at times are the best solution to livestock water needs when development, maintenance, and reliability are considered. What about drilling a well as a water source? At some point in developing a management system, a pressurized water system should strongly be considered. It will provide water where it is needed instead of forcing the manager to work with a few water sites. When considering developing water sources, just remember, each situation is different, and flexibility is rewarded when it comes to developing water sources. In most situations, the best way to start rotational grazing systems is to make a few simple or basic improvements in the current system. This first step will start the learning process and allow the manager to develop the system at a comfortable pace. It will also minimize "improvements" that later prove to be less than optimal. A lot of progress is made by simply closing the gate between two pastures. Remember, simply dividing an existing pasture in half is the start of a rotational grazing system. Being flexible throughout the whole process is key to putting rotational grazing systems together. Need any help? 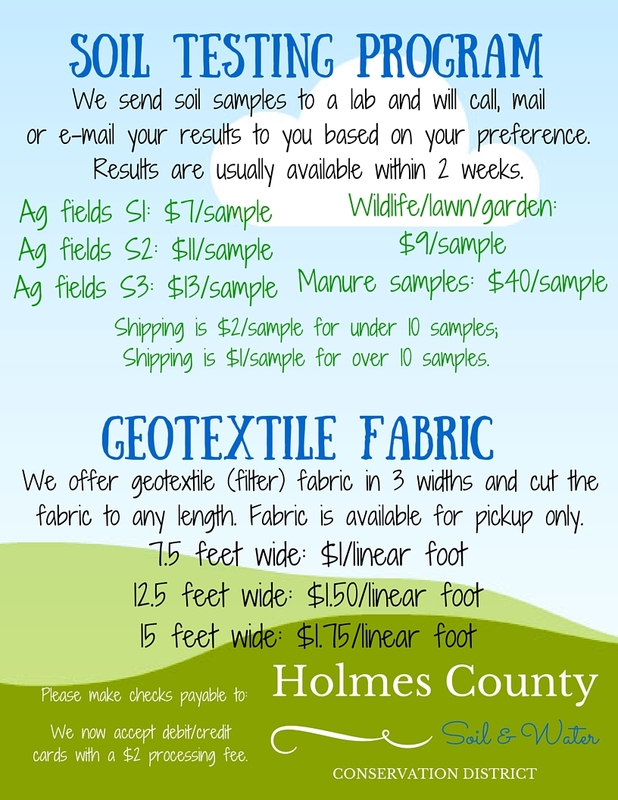 Contact your local SWCD/USDA-NRCS office, you can reach the Holmes office at (330) 674-2811. The office is located at 62 West Clinton Street, Millersburg, OH 44654.